This topic explains how to use the Performance software development kit (SDK) to do multiuser load testing in an on-premises environment. Visual Studio 2019 will be the last version of Visual Studio with web performance and load test features. In the future, we will be publishing some recommendations for alternative solutions. If you are using the Visual Studio and Test Controller/Test Agent for on-premises load testing, Visual Studio 2019 will be the last version. You can continue using it until the end of support cycle. If you are using the cloud-based load testing service, the cloud-based load testing service will continue to run through March 31, 2020. Until then, you can continue to use all of the experiences powered by this service without interruption. Alternatively, you can switch to on-premises load testing. For more information, see Cloud-based load testing service end of life. Microsoft Visual Studio 2015 Enterprise or a later version is installed. Use Task recorder to create a recording of the scenario that you want to test. Your task recording must start on the default dashboard page. Otherwise, the test won't be able to run. Start Microsoft Visual Studio as an administrator, and build the PerfSDKSample project. This project is in the PerfSDK folder. If you've already built the project, skip this step. Select Dynamics 365 > Addins > Create C# perf test from recording. In the Import Task Recording dialog box, enter the required details, and then select Import. A C# test is generated in the Generated folder for the project that you selected. The test that is generated might have to be edited to resolve any compilation issues. Follow these steps in the development environment. In Control Panel in Microsoft Windows, select System and Security > System > Advanced System Settings. 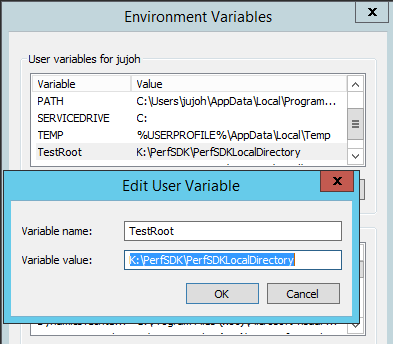 Verify that the TestRoot environment variable is set to the path of the PerfSDK folder. Download the selenium-dotnet-strongnamed-2.42.0.zip and IEDriverServer_Win32_2.42.0.zip files from http://selenium-release.storage.googleapis.com/index.html?path=2.42/, and extract the files. Copy the dynamic-link libraries (DLLs) from the selenium-dotnet-strongnamed-2.42.0.zip\net40 folder to the PerfSDK\Common\External\Selenium folder. Also copy the IEDriverServer.exe from the IEDriverServer_Win32_2.42.0.zip to the PerfSDK\Common\External\Selenium folder. Generate a certificate to use for authentication for the tests. To generate a certificate file, open a Command Prompt window as an administrator, and run the following commands. When you're prompted for a private key password, select None. -n "CN=127.0.0.1" gives a human-readable name to the certificate. The name of this certificate must be 127.0.0.1. Otherwise, the single-user tests won't be able to run. -eku 1.3.6.1.5.5.7.3.1 gives the purpose of the certificate. It indicates that the certificate can be used as a Secure Sockets Layer (SSL) server certificate. Install the authcert.pfx certificate file. When you install the file, make sure that you select Local Machine. Copy the authcert.pfx file to the PerfSDK folder. Open a Microsoft Windows PowerShell window as an administrator, and run the following commands to get the thumbprint of the installed certificate. 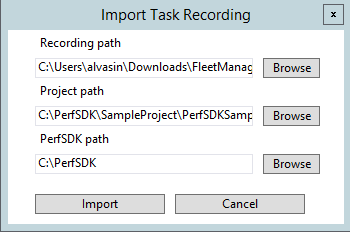 In Visual Studio, open the PerfSDKSample project that is in the PerfSDK folder. 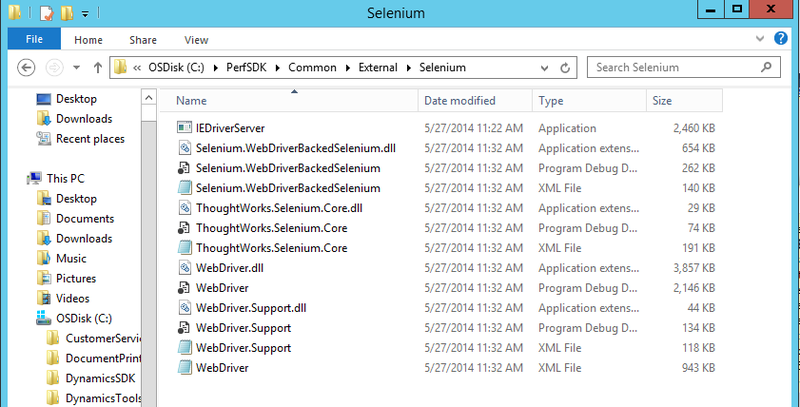 In the Visual Studio project, add a reference to the WebDriver.dll file in the PerfSDK\Common\External\Selenium folder. Open the CloudEnvironment.Config file, and replace the contents with the following template. In the CloudEnvironment.Config file, specify values for the following keys. These values replace the placeholder values in square brackets in the template. HostName – Specify the URL that is used to access your Microsoft Dynamics 365 for Finance and Operations on-premises environment. The URL should be [yourD365FOdomain]/namespaces/AXSF. SoapHostName – Specify the same URL that you specified for HostName. SelfSigningCertificateThumbprint – Specify the thumbprint that you retrieved from Windows PowerShell in step 7. UserFormat – Specify the email address of a user who has the System Administrator role in your Finance and Operations on-premises environment. The user must be an Active Directory Federation Services (AD FS) user. UserPassword – Specify the password of the user whose email address you specified for UserFormat. Username – Specify the same email address that you specified for UserFormat. NetworkDomain – Specify the URL of the AD FS identity provider. You can find this value by running the following SQL query against the AXDB database of your on-premises deployment. Follow these steps on each Application Object Server (AOS) VM in the on-premises deployment. Copy the authcert.cer file that you created in the Prepare the development environment section of this topic to the AOS VM. Install the authcert.cer certificate file. When you install the certificate, make sure that you select Local Machine. Also make sure that you put the certificate in the Trusted Root Certification Authorities store. Open the wif.config file in a text editor. The path of the file will resemble C:\ProgramData\SF\AOS1\Fabric\work\Applications\AXSFType_App19\AXSF.Code.1.0.20180717001108. In the file path, the AOS number (AOS1 in this example) will vary, depending on the AOS node that you're on. Additionally, the ProgramData folder is a hidden folder. Therefore, to see the folder in File Explorer, you must enable hidden items. In the wif.config file, find the authority that is named https://fakeacs.accesscontrol.windows.net. In the list of thumbprints for this authority, add the thumbprint of the certificate that you created in the Prepare the development environment section. In the following example, the fourth thumbprint has been added to the https://fakeacs.accesscontrol.windows.net authority. Open the AXService.exe.config file in a text editor. You can find this file in the same directory as the wif.config file. Search the AXService.exe.config file for "Aos.AosRole". Replace the line that contains "Aos.AosRole" with the following line. Setting the AosRole to AosRoleUnknown disables the limit on the number of web sessions per user. This is necessary to complete load testing with a large user load because the load test will create many sessions for a single user. Once you are finished with your load testing, reset this value to "AosRoleWeb". 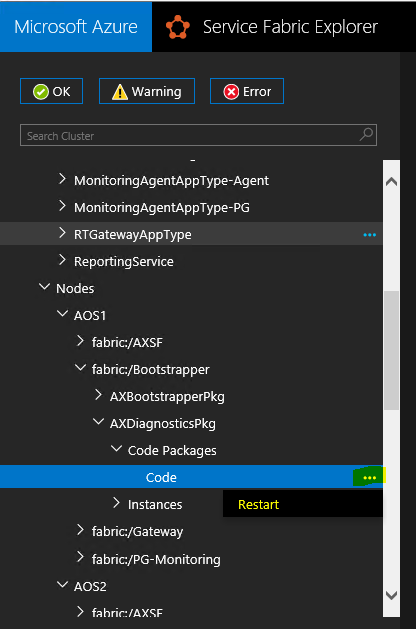 In Service Fabric Explorer, find the Code package for the AOS node, select the ellipse button (...), and then select Restart to restart the Finance and Operations application. In the PerfSDKSample project, find the PurchaseReq.cs file. This file is a sample single-user test. In the file, comment out the following lines. Select Test > Test settings, set the Default processor architecture field to x64, and then build the solution. Select Test > Windows > Test Explorer to view the list of tests. Sometimes, Visual Studio might not update the list of tests after you create a test script from a task recording. In this case, restart Visual Studio, and then reopen Test Explorer. Run the sample single-user test by right-clicking CreatePurchReq. Alternatively, you can run the test that you created from your task recording. When you run the test, Internet Explorer should be started, and it should replay the scenario that you recorded. After you create a single-user test by using the information earlier in this topic, you can convert it to a multiuser test. Add MS.Dynamics.TestTools.UIHelpers.Core; to your test script, and find the following line in the TestSetup method. Replace that line with the following lines. The test script that was generated by the Task Importer might contain a line that resembles the following line. Remove this line from any tests that will be run as load tests. This code is required only for single-user tests and has a negative effect on the performance of load tests. Make sure that the values that you entered when you made the task recording are randomized. 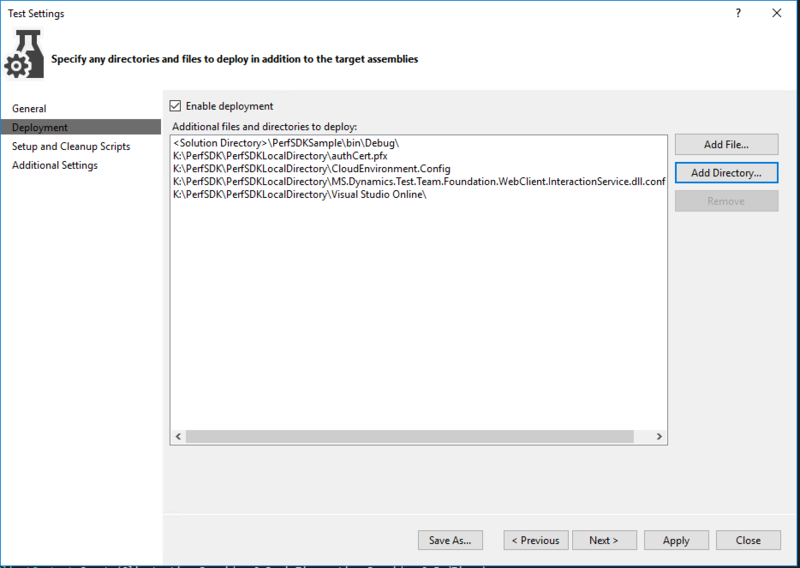 In the Visual Studio editor, open the ProcureToPay.cs file, and append the following lines in the TestSetup method. Download the installer (.msi) file for Microsoft ODBC Driver 13 for SQL Server from https://www.microsoft.com/en-us/download/details.aspx?id=50420. (Select the 64-bit version of the .msi file.) Put the file in the Visual Studio Online folder in the PerfSDK directory. Modify the contents of the setup.cmd file in the Visual Studio Online folder so that they match the following code. Modify the contents of the CloudCtuFakeACSInstall.cmd file so that the Import command has an empty string instead of 'password'. The third line of the script should resemble the following line. 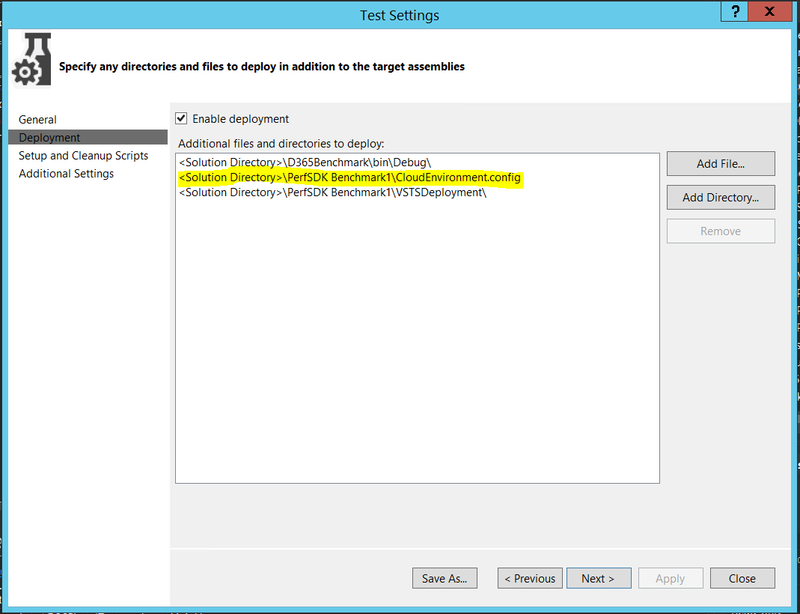 In your solution files, double-click the vsonline.testsettings file to modify the test settings. 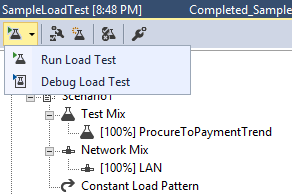 In the Test Settings dialog box, on the General tab, set the Test run location field to Run tests using local computer or a test controller. Your PerfSDK folder might differ. On the Setup and Cleanup Scripts tab, select the setup.cmd file that is in the Visual Studio Online folder in the PerfSDK directory. On the Hosts tab, select Run tests in 64 bit process on 64 bit machine. To run the test, open the SampleLoadTest.loadtest file, and select Run Load Test. When the test has finished running, you should see a summary that shows transaction results. Here is an example. To view various indicators for the test controller and test scenario, you can switch to the Graphs view. While tests are being run, information about your system isn't available in this view. To access this information, you must use Microsoft Dynamics Lifecycle Services (LCS) to monitor the CPU and memory usage of your AOS machine. Alternatively, you can set up perfmon directly on the AOS machine and set up the Microsoft Azure portal to monitor Microsoft SQL Server usage of Database Transaction Units (DTUs). This issue affects only single-user tests. Initialization method <Test class name>.TestSetup threw exception. System.InvalidOperationException: System.InvalidOperationException: Unexpected error launching Internet Explorer. Browser zoom level was set to 200%. It should be set to 100% (NoSuchDriver). Depending on the version of the local machine that is used, before you start the Remote Desktop Protocol (RDP) session, you might have to select Change the size of text, apps and other items. This field is available in Display settings in Windows. If those steps don't work, try to change the size of your remote desktop before you start the RDP session, so that the default zoom level in Internet Explorer is 100 percent. Initialization method MS.Dynamics.Performance.Application.TaskRecorder.TestRecord1Base.TestSetup threw exception. The certificate thumbprint that you copied into the CloudEnvironment.Config and wif.config files includes invisible Unicode characters. To determine whether the thumbprint contains invisible Unicode characters, paste it into a Unicode code converter, and see whether extra characters appear in the HTML/XML field. For example, you can use the Unicode converter that is available at https://r12a.github.io/apps/conversion/. The certificate wasn't installed correctly on the AOS machine. To verify that the certificate can be found on the AOS machine, run the following Windows PowerShell script. If the thumbprint doesn't appear in the Windows PowerShell console after you run the script, the certificate can't be found. To fix the issue, copy and install the .cer file that you created earlier in this topic to the AOS machine. If this issue occurs when you run load tests, the setup scripts might not have installed the corresponding .pfx file correctly. Verify that the password that is specified in the CloudCtuFakeACSInstall.cmd file matches the password that was set when the certificate was created. The tests process fails, and the following error message is shown. System.TypeInitializationException: The type initializer for 'MS.Dynamics.TestTools.CloudCommonTestUtilities.Authentication.UserManagement' threw an exception. ---> System.ServiceModel.EndpointNotFoundException: There was no endpoint listening at <web address> that could accept the message. This is often caused by an incorrect address or SOAP action. This issue occurs when the host that is specified in the CloudEnvironment.Config file can't be accessed from the machine that is trying to run the tests or create users. The web addresses that are specified by these keys must be the environment that you're testing. In a web browser on your developer machine, make sure that you can open the web address that is specified for the HostName key. This issue can occur when you run multiuser tests, or when you create users by using MS.Dynamics.Performance.CreateUsers.exe. The user who is specified as SelfMintingAdminUser in the CloudEnvironment.Config file must have the System Administrator role. This issue occurs when the System Administrator role isn't assigned to the user who is specified as SelfMintingAdminUser. To verify that you've specified the correct user, you can sign in to the endpoint and view the user's roles. An incorrect NetworkDomain value was specified for the user who is specified as SelfMintingAdminUser in the CloudEnvironment.Config file. You can find the correct value by running the following SQL query against the AXDB database of your on-premises deployment. This issue can occur when you run multiuser tests, or when you create users by using MS.Dynamics.Performance.CreateUsers.exe. It tends to occur when the AOS machine differs from the developer machine. System.TypeInitializationException: The type initializer for 'MS.Dynamics.TestTools.CloudCommonTestUtilities.Authentication.UserManagement' threw an exception. ---> System.ServiceModel.Security.MessageSecurityException: An unsecured or incorrectly secured fault was received from the other party. See the inner FaultException for the fault code and detail. ---> System.ServiceModel.FaultException: At least one security token in the message could not be validated. In the CloudEnvironment.Config file, either a value isn't specified for the IsAdfs key, or the value is set to False. Make sure that the value for the IsAdfs key is set to True. The certificate wasn't installed on the AOS machine. To fix the issue, copy the .cer file that you created earlier in this topic to the AOS machine, and install the certificate. The thumbprint of the certificate wasn't added to the wif.config file on the AOS machine. To fix the issue, see step 8 in the Run a single-user test by using the Performance SDK section for information about how to add the certificate to the wif.config file. After you modify the wif.config file, be sure to restart the application through Service Fabric Explorer. This issue usually occurs only when you run load tests. If the file is missing, add it to the deployment items in the test settings. There are two files that have very similar names. The name of one file ends in *.dll, and the name of the other file ends in *.dll.config. The *.dll.config file must be in the deployment items in the test settings. Initialization method <Test class name>.TestSetup threw exception. System.TypeInitializationException: System.TypeInitializationException: The type initializer for 'MS.Dynamics.TestTools.CloudCommonTestUtilities.Authentication.UserManagement' threw an exception. ---> MS.Dynamics.TestTools.TestLogging.EvaluateException: Assert.Fail failed. DateTime="10/13/2017 14:42:55" "The type initializer for 'MS.Dynamics.TestTools.CloudCommonTestUtilities.Authentication.SecretSettingsHelper' threw an exception.". This issue occurs when no value is specified for the SelfSigningCertificateThumbprint key in the CloudEnvironment.Config file. In the CloudEnvironment.Config file, find the following line, and paste in the thumbprint of the certificate that you created and installed. System.Net.Sockets.SocketException: An existing connection was forcibly closed by the remote host. Run the following Windows PowerShell script on the development machine. This error only occurs when you run load tests by using Microsoft Visual Studio Online. A hotfix is available that resolves this issue. The Microsoft Knowledge Base (KB) number is 4095640.